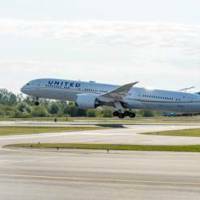 United Airlines will replace its Boeing 777-200 aircraft currently serving the route between Haneda Airport and San Francisco with Boeing 787-9 Dreamliners on Aug. 3, 2016. The airline was the first to launch the 787-9 on its nonstop service between Los Angeles and Melbourne last October. 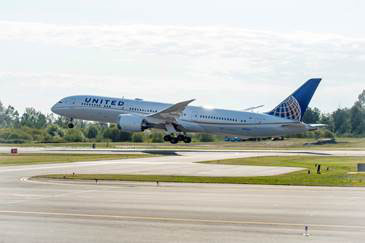 Starting in March, United will begin replacing its current fleet with the Dreamliner on three other Pacific routes: between Sydney and San Francisco, Sydney and Los Angeles, and Taipei and Los Angeles. The Dreamliner will feature a total of 252 seats — 48 in United BusinessFirst and 204 in coach, including 88 Economy Plus seats with extra legroom and increased personal space. BusinessFirst offers fully flat seats of up to 2 meters in length, with a 15.4-inch touch screen monitor for on-demand entertainment while Economy Plus provides almost 30 cm more legroom than economy. Vanilla Air, a low-cost carrier wholly owned by ANA, will add two more daily flights between Narita Airport and Kaohsiung, Taiwan, from Jan. 1. In addition to afternoon flights, passengers will have the option of flying to southern Taiwan in the evening. JW 125 will depart Narita at 5:55 p.m., arriving in Kaohsiung at 9:35 p.m. On the return, JW 120 departs Kaohsiung at 8:20 a.m. and arrives at Narita at 12:45 p.m.
A one-way ticket on the “Simple Vanilla” plan starts from ¥6,990, while the “Komikomi Plan,” which includes a checked-baggage allowance of up to 20 kg, starts from ¥9,990. Tickets can be purchased via the company’s website, vanilla-air.com, or by phone through its reservation center. It will also increase its flights between Taiwan’s Taoyuan airport and Narita Airport to four daily this winter. Ethiopian Airlines has started offering online check-in for all its flights. Passengers on international flights can avoid lengthy lines by checking in online from 48 hours to 2 hours before departure. This can be done at www.ethiopianairlines.com/AA/EN/book/booking/web-checkin, where seats can also be changed and baggage registered for checking in. Users should print two copies of the boarding pass and bring both to the airport. If there is no baggage to check users can proceed to the boarding gates directly. Those with bags to check should present them at the check-in counter 60 minutes prior to departure. The online check-in service is temporarily unavailable from some airports in Africa, Seychelles International Airport and London’s Heathrow Airport. See website for details.